Azizi Life partners with rural Rwandans to bring fair trade beauty to your life and theirs. Your visit makes a difference! In addition to a fair wage for your hosts, 5% of your entire payment is donated to Impact projects. Thanks to Rwanda’s lush green hills, beautiful valleys and welcoming people, it may be one of the easiest and most exciting places in East Africa to explore by foot. All around the rural communities, there is already a vast network of paths ready and waiting for you to explore. Enjoy local knowledge and good company as you explore with one of our local guides! Our guides, who speak English or French, will enrich your walk with information on the communities you pass and points of interest. Enjoy a scenic rural excursion or choose an in-town exploration, visiting the local markets and experiencing other aspects of urban life. All our walks are designed to be flexible and so you are able to start and finish at the time of your choice and, choose a distance and pace that is suitable for you. Once you have booked we will contact you to find out all of your preferences. 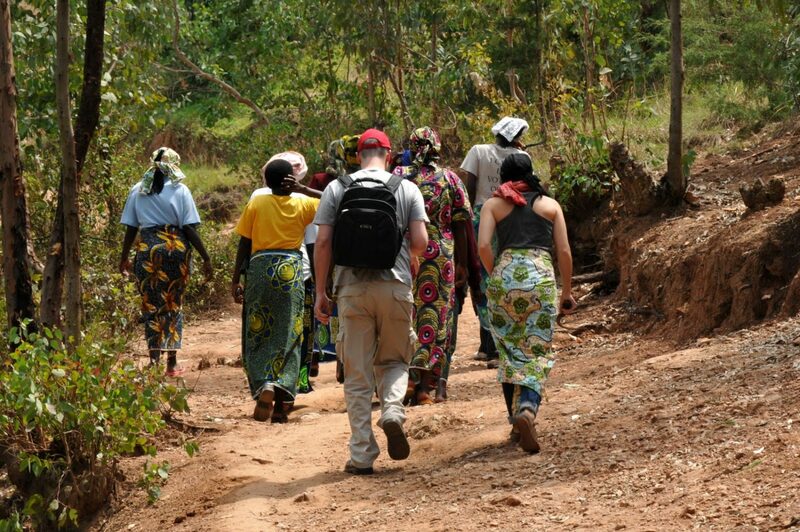 Whether you choose our mapped routes or create your own adventure, Azizi Life Pathways is a wonderful way to get out and enjoy Rwanda! Alternatively, if you would like more information, please do not hesitate to email us on [email protected] or call us on +250-7858-1146, please note that this number is in Rwanda and so there may be a time difference and extra charges for an international call. Men may wear trousers or shorts. Women should wear trousers or a skirt that covers the knees, as Rwandan women usually don’t show their knees. We recommend that you wear closed-toed shoes: Walking shoes are useful on the paths, which can be steep and slippery. Be prepared to spend time in the sun. Your guide will be happy to answer all your questions, and to translate when you would like to speak with people you meet along the way. Ensure that you have health insurance to cover your visit. We do all we can to ensure your safety during your visit. In the case of an accident, we will ensure you get appropriate medical attention. However, you must cover the costs through your insurance. Some of the paths are steep and can be slippery after rain, but you will be given a hand if you need it. Sometimes members of the community come and stare at white visitors for a while, as white people are seldom seen in rural communities. They are simply curious. Very occasionally, in the community, a neighbor may ask you for money. People often ask each other for money here, and are not offended by a refusal. They are all the more likely to ask a white visitor, as Rwandans often think that white people are fabulously rich. If asked for money, it is best to say no, we donate 5% of tourism revenues to our local nonprofit, Azizi Life Impact, for community development work. Azizi Life partners with over 30 independent groups in Rwanda - over 500 artisans... and growing! Rising from the horrors of genocide, artisans from all backgrounds have joined together once again through their art. With their fair trade income, parents are caring for the health, nutrition, and education of their children. Families are building better homes. Women are rising out of crippling dependency to become contributors in their communities. Our artisan partners have a vision to be leaders for wholeness in their community, and we are privileged to partner with them. Azizi Life offers a range of products skillfully crafted from locally-sourced, natural fibers such as sisal, banana leaf, and forest grasses. Our line of baskets highlights some of the best of Rwandan traditional and modern design. Artisans and designers collaborate to create new designs and products in our lines of baskets, home goods, and holiday décor. Azizi Life is a faith-based social enterprise in Rwanda committed to sustainability, collaboration, and putting people first – artisans and customers alike. Founded in 2008 under the international NGO Food for the Hungry, Azizi Life has become a bridge to connect hardworking artisans to the global market. In addition to flourishing sales in Rwanda, Azizi Life offers products to US customers from our warehouse in Spokane, Washington, as well as FOB sales directly from Rwanda.